New hardwood floors are a great way to spruce up your home and may even increase its value. At Bassett Carpets we have a variety of hardwood flooring options to choose from that will appeal to a wide range of budgets and individual tastes. If you want to be sure your new floors look the way you want and wear as you expect them to, your best option is to have them installed by a professional hardwood flooring specialist. An experienced installer knows the differences between the various types of hardwood flooring available, and will have required skills and tools needed to do the job right the first time. If you do however plan to install your own hardwood flooring, you should check the manufacturer’s approved installation guidelines and warranties before you get started. Consider the fact that a professionally installed hardwood floor is more likely to be covered by the manufacturer warranty. The method used to install your new flooring is determined in part by the width, thickness and construction of the flooring you’ve chosen and where you want it installed. For a solid hardwood flooring installation, methods for fastening can include stapling, nailing, or gluing to the subfloor layer. Solid hardwood floors do not respond well to changes in temperature and humidity, so they are not recommended for applications below the grade line of your property. For a hardwood flooring project in your basement, bathroom, or kitchen, engineered hardwood may be a better choice because it has no issues with climate changes. Hardwood flooring requires a flat, clean surface for a proper installation. To get the area for your new flooring ready, you might need to remove your existing flooring. 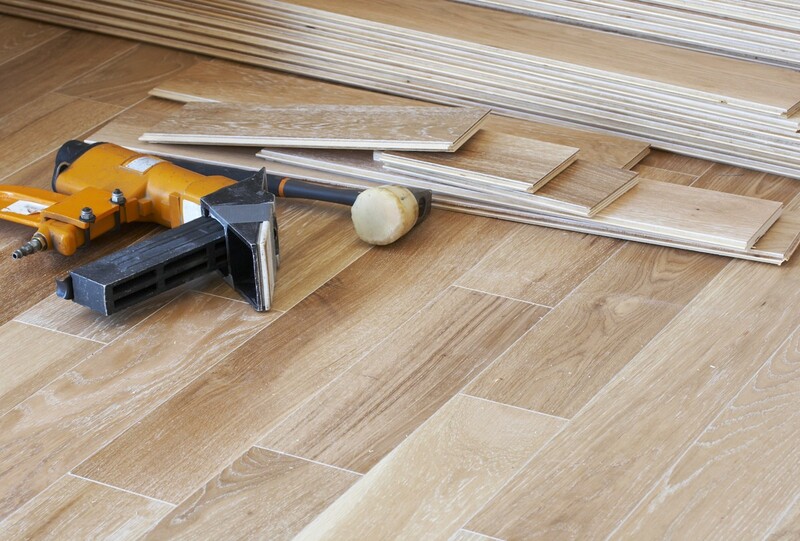 This process will be different for different types of existing flooring and there may be extra work involved if your previous flooring is glued down or set in tile adhesive. Calling in a expert for this work is a good idea, since a professional hardwood specialist will have all the necessary tools and knowledge to do the job right and decide when the flooring surface is ready. A pro may also be able to assist with the disposal of your old flooring. All the furniture will need to be removed from the rooms where your new hardwood is to be installed. A professional moving and storage company can be a big help at this point, especially for large or heavy items, or items requiring special care and attention. A professional moving team can have a whole house ready for new floors in as little as a day. This will minimize the amount of time you have to live without your furniture at each end of the job. You will also want to take down photos or other wall hangings which can be damaged accidentally during the installation of your hardwood flooring. To ensure everyone’s safety and to help the job run smoothly, keep children and pets away from the work area for the duration of the job. Stay off your new floors for the recommended amount of time after the job is done. The stain and varnish that has been used on the surface will need time to cure properly. The lead installer will be able to advise you on how long this will take.